I began my Christian life trying to be holy by keeping God’s commands, and I discovered it was a dead-end street. First, I couldn’t keep the law (Rom. 7:14-25; Gal. 2:16, 3:21-24, 6:13), and when I failed to keep it, I felt condemnation. It’s like focusing on getting darkness out of a room by swatting at it. It just doesn’t work. Since it is clear in Scripture that there is no condemnation to those who live in Christ(Rom. 8:1), I realized I was doing something wrong, because I had guilt and condemnation within me a lot of the time. I needed to step out of my “self-consciousness” and discover what it meant to “be in Christ” or to be Christ-conscious. The Bible said this was the key to overcoming condemnation. I needed to stop picturing myself as a self-contained unit, and adopt the four pictures the New Testament provides for me (a vessel, a temple, a branch and a body – with Christ as the head). In each of these pictures, I am hollow, designed to be filled with and energized by another. I am not a self-contained unit. So it’s time to change my picturing. When I picture reality the way God has designed it, life works. Picturing error messes life up! A picture is worth a thousand words. They are extremely powerful in moving my life forward in Christ or backward into self, sin, and ultimate demonization. Paul says he is dead and no longer alive. Instead, Christ is living His life out through him (Gal. 2:20). This is a new reality which I need to picture if I want life to work. When I need to love the unlovable, I simply smile, picture Jesus alive in me, and say, “Thank You, Jesus, for living within and releasing Your love, mercy and compassion out through me. I receive Your life flow and release You to this person” (1 Cor. 6:17; Acts 2:25; Ps. 16:8). So I’m not looking at myself, or a biblical law which commands me to love, or the weakness of my flesh to keep this law of love. Instead, I am looking at Christ, Who is joined to me. What is He doing? What is He saying? What are His emotions toward this person? Once received (which can be done in moments), I then say “Yes, Lord” to what He has revealed to me, and I do what Jesus is doing. I am NOW radiating Christ’s life into the situation. So instead of trying to perfectly keep laws, I seek to release a Person Who lives within me. My one and only goal is to see Him present and communicate with Him, receiving His perspective, wisdom, creativity, solutions, anointing and power. These come as I tune to the flow of His indwelling river, the Holy Spirit. I live a supernatural life. 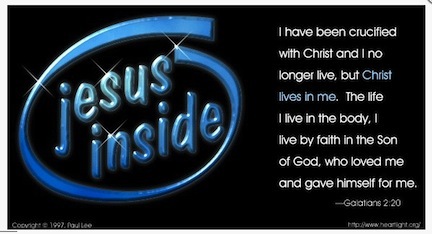 I abide in Christ. This is the New Covenant. This is the Christian lifestyle. This course is offered through Communion with God Ministries.